Mmmmm, I love your scent. And what scent would that be? You’ve always been my breath of fresh air. You read these things posted on Facebook and Pinterest and they sound so right. We claim them as our own personal mantras, but how many of us can really follow this advice? 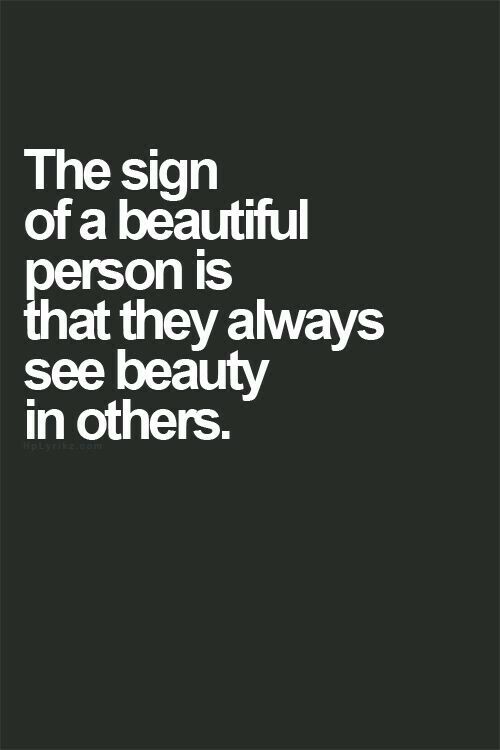 I’ll be honest, I don’t always see the beauty in others. I all too easily see the ugly in others, and more easily, I see the ugly in myself. We are messy, selfish creatures. Now that I’m back at work in a large office of a couple hundred people I have seen some real nastiness. I forgot about this aspect of life having taken a 14 year sabbatical from the daily grind. Working from home does have its benefits and I didn’t have to deal with coworkers. I am again up close and personal and gossip is everywhere. Judgements, too, are rampant and so many bring all their problems with them wherever they go. I’ve figured out my personal strategy for staying out of the drama and I have to or else I’ll get stuck in the muck and mire. I don’t believe that a beautiful person only sees the beauty in others. A beautiful person sees the truth of a person and acts accordingly. A beautiful person doesn’t allow another’s ugliness to influence decisions. A beautiful person has empathy, but will give the gift of accountability. A beautiful person sets an example by remaining true to honed character. I’m around some who are challenges and getting drawn in would be all too easy. I’ve chosen to gracefully stay out of unnecessary controversies, as per my usual way, by not bringing my personal life to work. People tell me less of their garbage because they know I can’t get drawn in. The advantage for me is not only staying out of other’s dramas, but people are more apt to present a better version of themselves because they know the other junk doesn’t fly with me. In order to see someone’s beauty you need to set the stage so that their beauty reveals itself. I recently turned 50. 50 is not an easy age to come to grips with. I’m in a transition right now; a major life change. Sometimes I get overwhelmed because starting over at 50 isn’t easy. I’m strong, but I question my endurance. Coach and I celebrated my birthday at home. The kids were at sleepovers and we settled in with a couple of bottles of wine and some yummy take out from a nearby bistro. We listened to our favorite songs, talked, laughed, and played. It was lovely. Coach had to go in to work the next morning and I had some quiet time to reflect. Out of nowhere I had an epiphany. It left me stunned and shaken. I called Coach immediately so I could discuss it with him. I knew I was discovering something about myself. I have always tried to dig deep inside to figure out my blocks. I know I have them, but I don’t know why they’re there. I’ve spent many years examining my ways. Just when I think I have a grip another problem occurs and my progress becomes stunted, even regressing. At 19 I was going to school and waitressing. I was excited about my life and I made the most of every day. I studied hard and worked hard. One day, while at work, I received an emergency phone call from my mother. She failed to tell me to sit down so she could prep me for the news I was about to receive. As soon as I picked up the phone and said hello she screamed at the very top of her lungs the words I can never unhear, “DADDY’S DEAD!!!! !” I stammered, “W-w-what?” She began screaming it over and over and over, completely emptying herself of emotions and dumping them all on me. I dropped the phone and sprinted out of the restaurant into the middle of the street and into oncoming traffic. A childhood friend, who also worked at the restaurant, ran after me and pulled me out of the way of a tractor trailor. He saved my life. Since that day I have always suffered from work-related anxiety. I have to psyche myself up to go to work. Every now and then I start to panic about work and I just can’t go in. When I was younger I quit jobs because I couldn’t take the pressure. I had jobs that were great and I was fine the whole time. I had other jobs that put me in full-on panic mode. The difficulty of a job was never a determining factor, but rather, the people at the job were the make or break. I never put together the correlation between my work anxiety and the day my father died. As I write this it seems so obvious, and yet, it never dawned on me that I have associated work with tragedy, work with loss, work with insecurity, fear, death, and panic. No wonder I go through bouts of near-crippling anxiety. No wonder when there are problems at the job I want to run away. My new job is going so well. Honestly, I took this job out of necessity, but it does feels good to work again. I like getting paychecks and having great benefits. I had my first performance evaluation and I had a perfect score, the highest in the class. I just completed my fourth week of an intensive 12 week training program. I probably have the least amount of formal tech training, but I have over 30 years of on the job and real life experience. Many in class are young enough to be my kid and have degrees in computer science. I have the most managerial experience in the class. I was told I will move up fast in the company. I went home with a huge smile on my face. My company offers free and confidential counseling and I plan on taking advantage of it. Knowing my work related fears is the first step. Having guidance and tools to help work through almost 31 years of layers of confusion is welcomed. I embrace this unique opportunity. I have big plans for my future and my career. This is the first step. My 50th year on this planet has started well. The day after 50 will always be remembered as the day I woke up from the shock of my father’s death.